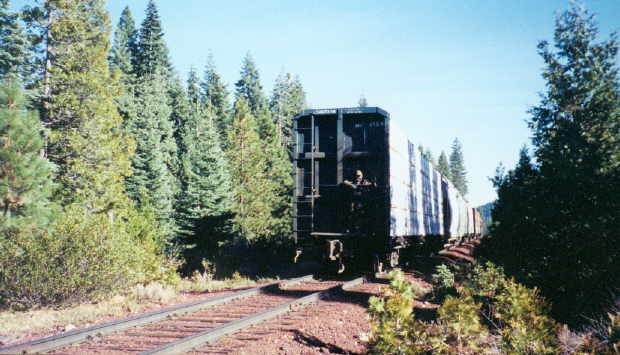 The Yard & Hill job is the only of the freight jobs still operated by the McCloud Railway today, and it usually is called only to move stored cars off and on the railroad. 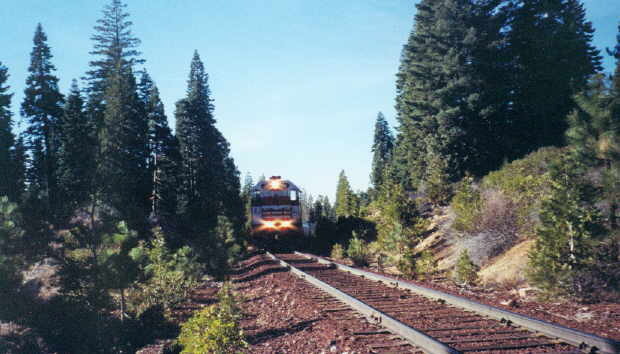 Prior to the end of freight service east of Burney in 2006, the job was called the next business day after every Sierra Job and usually ran two or three days per week, depending on the schedule of the Sierra Jobs. The primary function of this job was to weigh all cars brought from Burney the day before, then take the Mt. Shasta City bound cars “over the hill” to the Union Pacific interchange in Mt. Shasta City. This job would then return to McCloud and build the next day’s train to Burney as well as completing any additional yard or switching work that needs to be done in the McCloud area before going off duty. 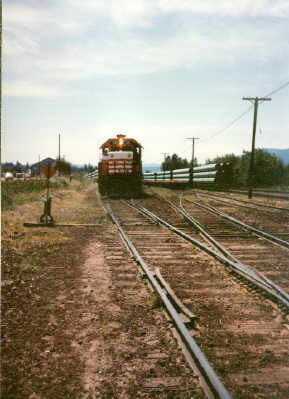 The switchback at McCloud causes the train to operate in reverse for half of it’s trip. Normal operations see the trains depart engine first from McCloud to the switchback at Signal Butte (5 miles west of McCloud), where the entire train will reverse direction for the remainder of the trip up and over the summit before descending into Mt. Shasta City. The return trip sees the train go engine first out of Mt. Shasta City to the switchback, where it will then reverse direction for the remainder of the trip to McCloud. A Yard & Hill Job from an earlier era: Baldwin diesels #29 and #34 moving a Mt. 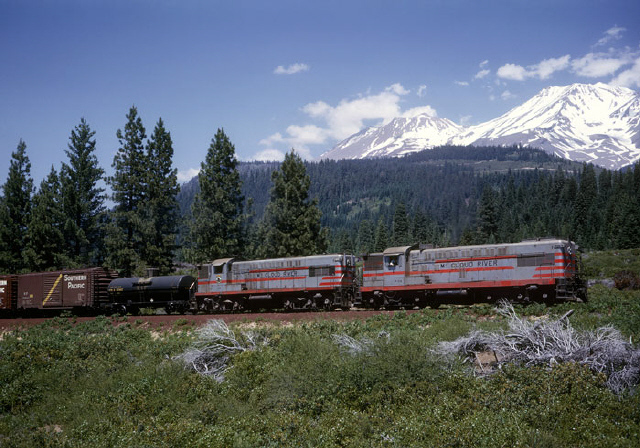 Shasta bound train up the hill in the late 1960's. Photo by and courtesy of John West. McCloud, CA, 8/1992. 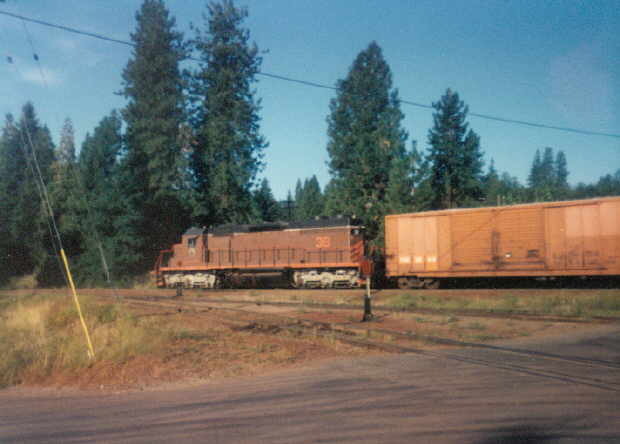 Locomotive #38 is seen here switching empty boxcars while working a Yard & Hill job in the McCloud yards. Pierce, CA, 11/2002. With the #38 in the shops and the #37 going to Lookout, the #36 is left to handle the Yard & Hill Job by itself this day, requiring that the railroad today take the Union Pacific bound traffic over the hill today in two cuts. Here conductor Keith Jones rides the first cut as it arrives at Pierce, the summit of the hill between McCloud and Mt. Shasta. The train has already gone through the switchback and is now backing the rest of the way to Mt. Shasta City. Pierce, CA, 11/2002. The #36 crests the top of the hill at Pierce, still backing towards Mt. Shasta City. McCloud, CA, 5/2003. 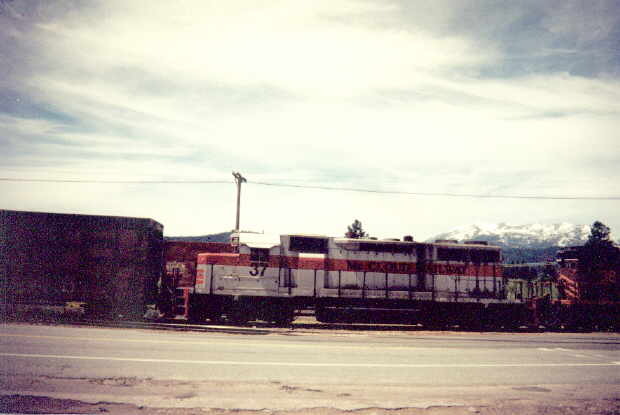 Locomotives 37 and 38 are seen here switching cars in the McCloud yard. Mt. Shasta City, CA, 5/2003. The Yard & Hill Job is seen here working the interchange with the Union Pacific in Mt. Shasta City. The #39 is seen here switching pipe cars in the Mt. 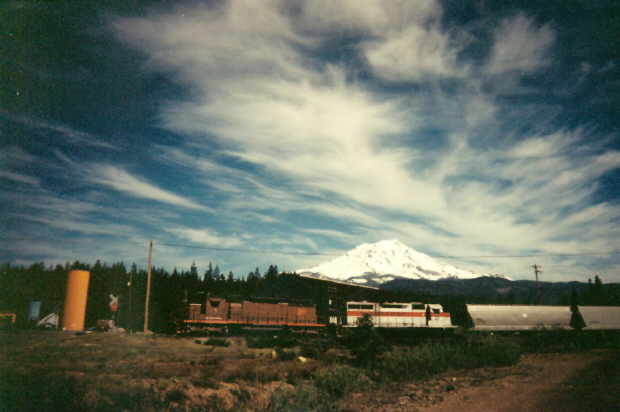 Shasta City yards. Photo by Anna Moore.